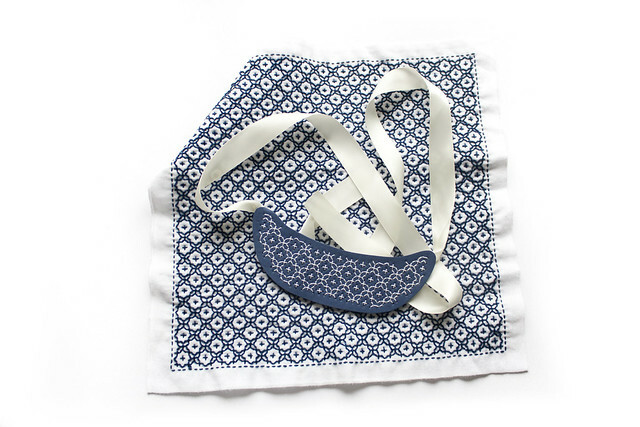 The traditional Japanese craft of sashiko embroidery is given a new twist by combining the established stitch patterns of sashiko with modern materials to make a piece of unique jewellery. 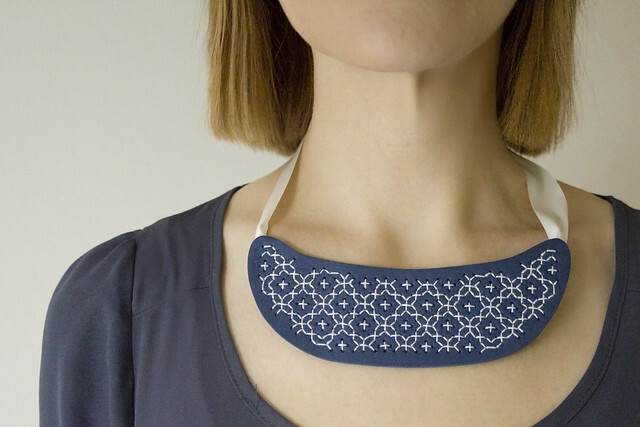 The crescent-shaped statement necklace has been a popular sight in high street fashion this year, and by downloading this project with free template and easy-to-follow tutorial it is possible to make your very own wearable piece of embroidered art and get a first taste of the simplicity and beauty of Japanese Sashiko embroidery with only a few simple materials and very little time. 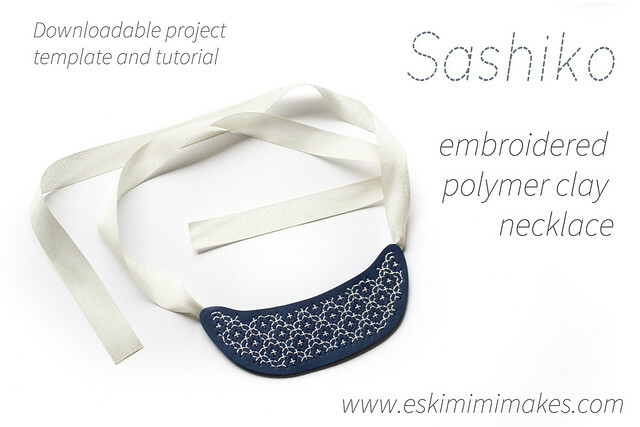 Begin by downloading the Sashiko Embroidered Polymer Clay Necklace Template and printing the file to give you your paper template. Cut out the paper template piece along the solid outer line and prepare polymer clay by working and kneading it to soften if required. Roll the block of polymer clay into a sheet 1.5-2mm thick, using either a smooth rolling-pin or pasta machine to give an even sheet of clay. 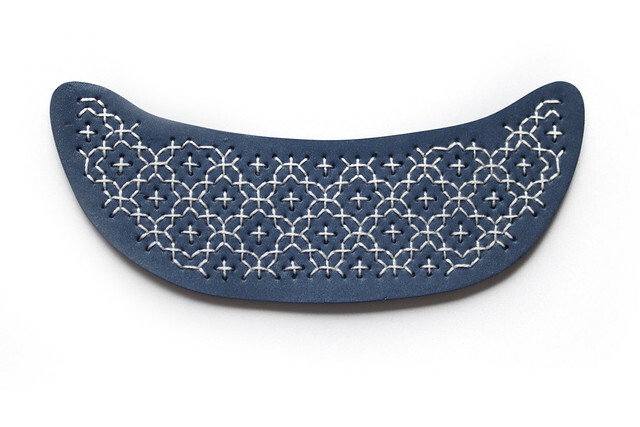 Lay the sheet of clay on a cutting mat or other suitable cutting surface and cut smoothly around the edge of the clay to give the correct shape to the clay. Lift paper template from polymer clay shape to check it has not adhered. Place polymer clay shape on a piece of card, ready to be baked. 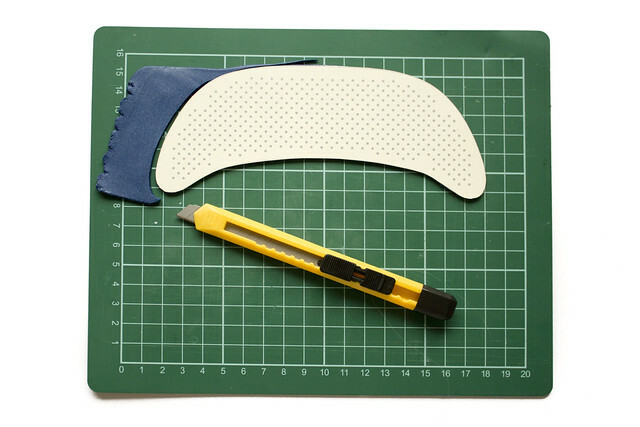 If desired, smooth outer edges with a wet finger (or keep edges crisp and defined if preferred). 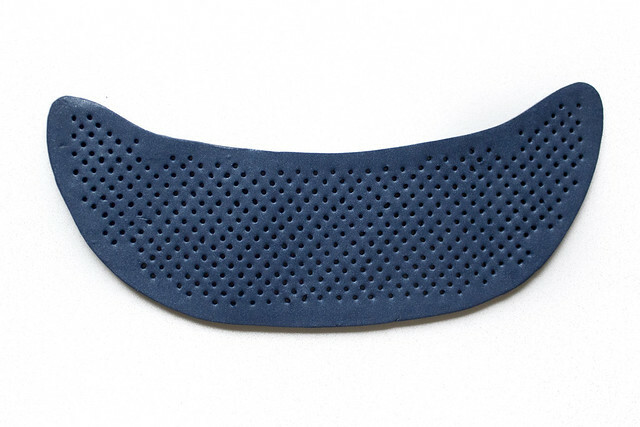 Alternatively, edges can be sanded using a fine-grade sandpaper once hardened. Place paper template back on to shape and re-align if necessary. Using an easy-to-hold push-pin with a little ‘handle’ pierce through the paper and clay at each marked dot on the template. Push the pin straight down, vertically through the centre of each dot and through to the card beneath. Once every dot has been pierced, remove the paper template by carefully lifting it off of the clay. Re-smooth the outside edges if required. 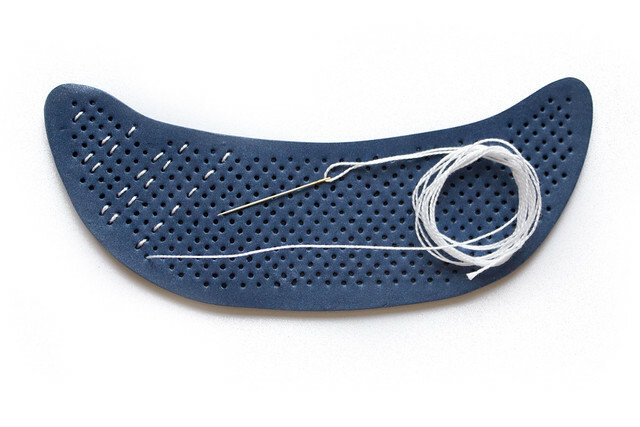 Using the large tapestry needle, fine knitting needle or an alternative tool that will result in holes large enough for the chosen embroidery needle to pass successfully through, widen each of the push-pin holes to a suitable size, ensuring that it is possible to see the surface of the card through each of the resulting holes in the clay. Bake the clay piece on the card at the recommended time and temperature setting as given by the manufacturer. Sculpey, one of the main manufacturers of polymer clay, recommends paper or card as a baking surface when using polymer clay, as do Fimo, another well-known polymer clay brand. This will help prevent the reverse of the baked piece from being shiny and sticking uncomfortably to skin. Once the polymer clay has baked for the recommended time, remove immediately from the oven. The clay will retain some malleable qualities whilst still warm. If any of the holes have narrowed during the baking process the can be turned over and the holes widened from the back using the push-pin or tapestry needle. If the polymer clay appears to have bowed whilst in the oven, placed a heavy hardback book on the piece whilst it cools, or overnight, to ensure that the piece lays flat. Alternatively, shape over an appropriately curved bowl if a degree of dimensionality is preferred, being careful not to distort the holes. Begin the Sashiko embroidery pattern by stitching lines in the directions as given in the four steps of the printable template and tutorial. 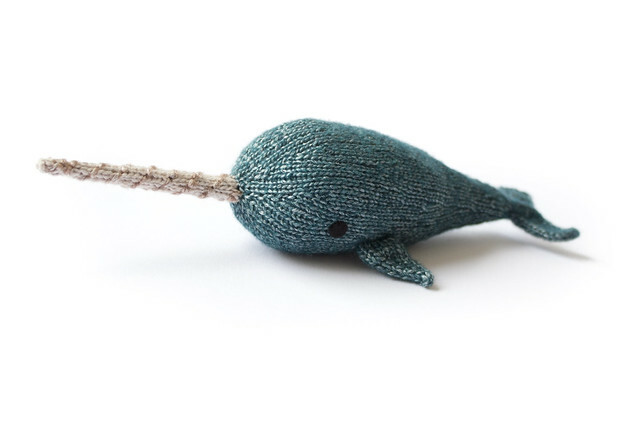 Secure the end of the thread with a knot and be sure to follow the patterning on the tutorial sheets to ensure correct patterning. Once all stitching is complete, check to ensure that the pattern is complete and that all threads have been secured at the back. Thread ends can be re-inforced by using a small amount of clear nail varnish on each of the knots and leaving to fully dry. Take a length of ribbon 1m in length and cut in half. Raw ends of satin ribbon can be sealed by holding them near to a candle flame to stop them from fraying. Always do this close to a sink of water and away from children. Secure the ribbon to the top corners of the polymer clay on the reverse using either a clear craft glue or hot glue gun. A piece of felt cut slightly smaller than the polymer clay can be glued to the reverse of the polymer clay once the ribbon is in place if desired, though this is not necessary for anything other than the appearance of the reverse, which nobody will see. 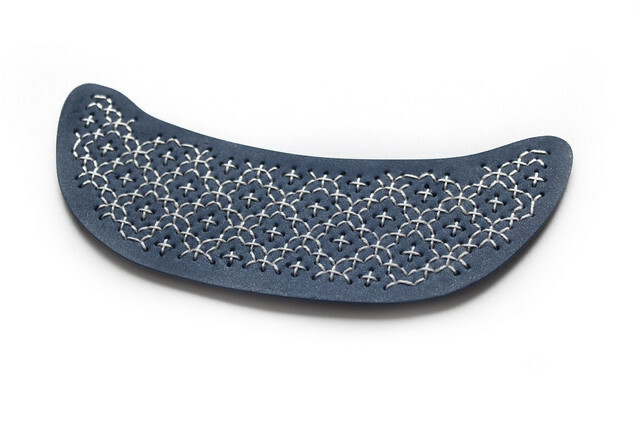 The resulting necklace is comfortable to wear due to the lightweight materials used. 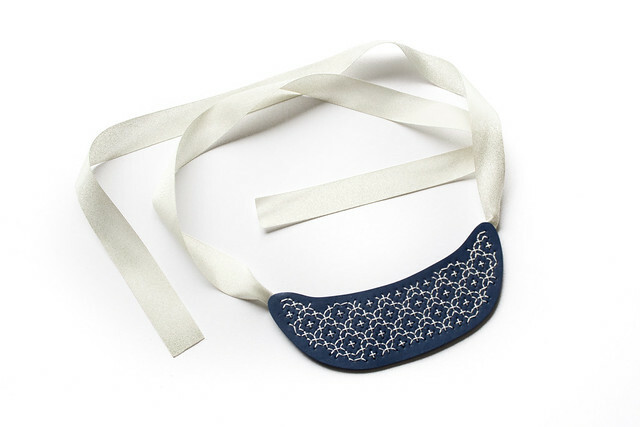 Wide, soft ribbon will provide comfort around the neck so that this piece of statement jewellery is as much a pleasure to wear as to behold. For more tutorials and projects using embroidery, polymer clay and many other crafting techniques please see the Eskimimi Makes Tutorials and Free Downloads & Projects pages. This is so pretty! I can’t wait to try this. OlÃƒ¡, Janilson. SÃƒ£o emails falsos. ReforÃƒ§amos que nÃƒ£o realizamos este tipo de campanha. O ideal Ãƒ© apagar imemeatadinte mensagens do gÃƒªnero e nÃƒ£o acessar qualquer link apresentado. Obrigado.